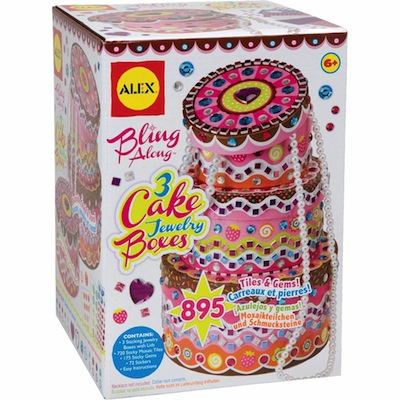 Bling Along 3 Cake Jewelry Boxes - Decorate, Stack and Store. Decorate your 3 boxes like a wild cake with tons of stickers and gems. Includes 720 sticky mosaic tiles, 175 sticky gems, 72 stickers, 3 stacking jewelry boxes with lids and easy instructions. Ages 6 and up.